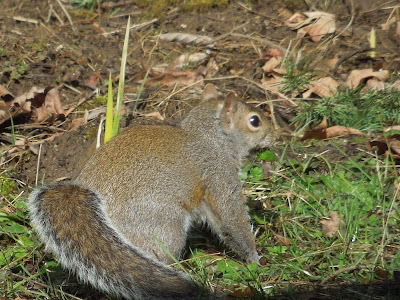 In the fall, three or four of them will chase each other around the hillside, but usually they stay further away from the house. 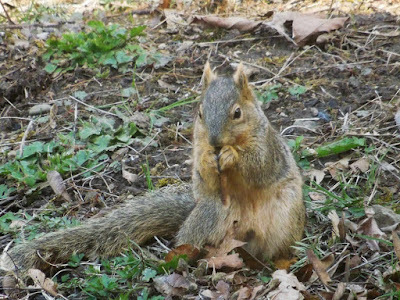 Also, we spotted a woodrat on our front steps a couple years ago, so I got a little nervous when the squirrels started sniffing around the steps. 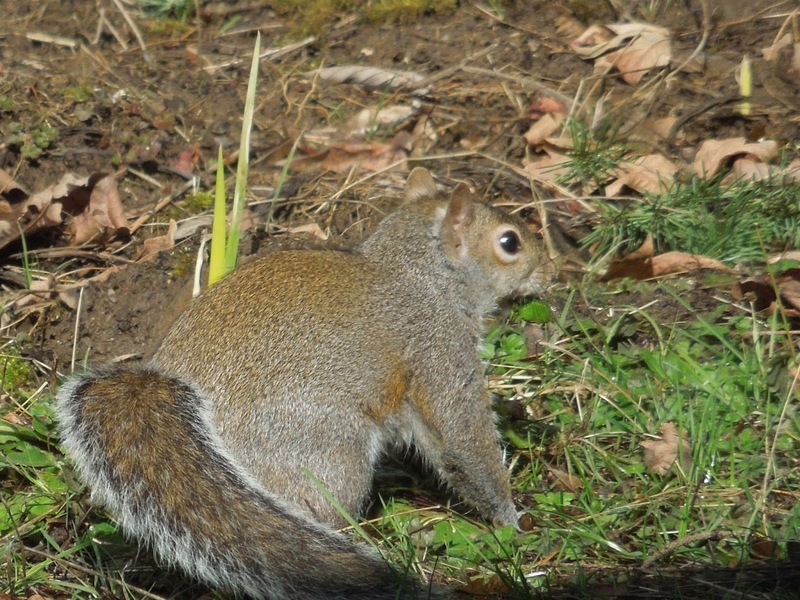 Was the bird feeder attracting the squirrels? Were we going to have problems with mice and rats again? After watching the newcomer for a few minutes, though, I realized what was going on. It’s a bit of a complicated explanation, so bear with me! 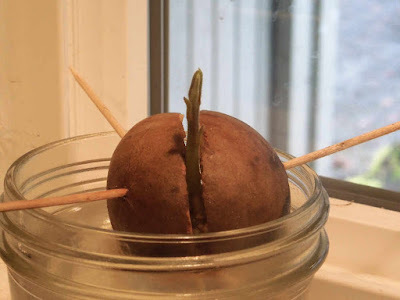 This part of the story goes back to November, when we tried to sprout an avocado seed for the first time. As you might guess, sprouting an avocado seed is a very slow process. At the time, I poked a couple toothpicks into the sides of a seed and set it in a tub of water. A few weeks later, we checked in and couldn’t see anything happening. 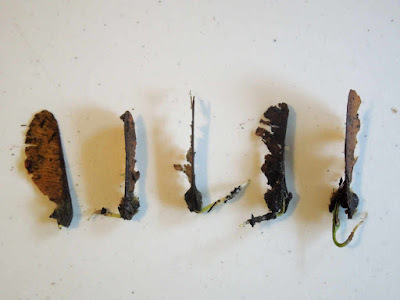 We waited a few more weeks, and just when we were about to call the experiment a failure, I noticed a little knobby root poking through a crack in the seed. So, we cleaned out the tub, gave the seed fresh water, and left it alone. After a couple more weeks, the root had split into three roots, but there was no sign of leaves. We kept waiting, and finally, at the end of January, a small shoot appeared! By early March, the shoot was several inches tall with a couple thin, not terribly photogenic leaves. Eventually, though, I decided to move the seed into a pot. I’d left several planter pots on our back porch over the winter. So, when I decided to pot the avocado sprout, I grabbed one of them and brought it inside. The pot was already filled with dirt from a failed planting experiment last year, but as I dug a small hole for the avocado seed, I also discovered half-a-dozen maple seeds mixed in with the dirt. Our maple trees in the backyard were extremely prolific last year! Some of the seeds were even starting to sprout. Given that I’m a bit obsessed with seeds, plants, and nature in general right now, I gathered up the seeds and lined them up on our table to take some photos. As I did, my husband mentioned that he’d found hundreds of maple seeds sprouting in our gutters. We’d had a bit of trouble with our roof after a storm, so he’d been up on our roof a couple days before to check the damage. While he was there, he’d cleaned out the gutters again. He'd cleaned them back in the fall, but they'd filled up again—the way they tend to do. As usual, he’d tossed the debris down into the yard. I’d raked up most of the leaves last fall, but we hadn’t cleaned up the gutter debris yet, so there were little piles of pine needles and maple seeds scattered across our front yard, especially around the front steps. 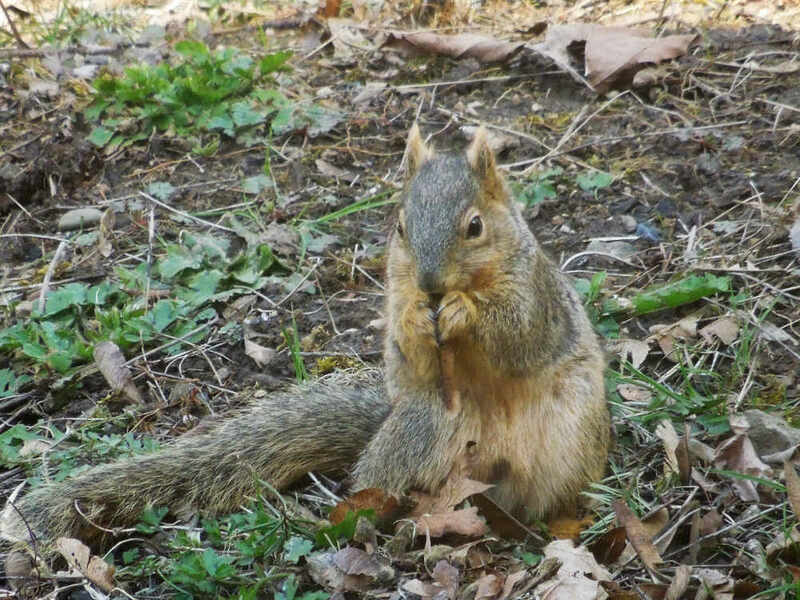 And the squirrels were digging through the piles to eat the maple seeds!